Our regional newsletter, Southern Breeze News (SBN), contains exclusive market tips, publishing news, business and craft tips, success stories, event information, and more. Here's how to send us your good news and helpful tips. Articles and artwork for interest for the SBN are welcome for consideration from current SCBWI members. Please download, read and follow the guidelines, tips and style rules in this Writer's guidelines 2014. Submit your work to Editor/Publisher Dori Kleber. Articles on craft, marketing and inspiration are needed. If you are interested in interviewing another member for the member profile, please contact Dori Kleber two months prior to the deadline. We need spot art as well as cover art. If your work is chosen for the cover art, you will be highlighted in the newsletter through a full-page interview. 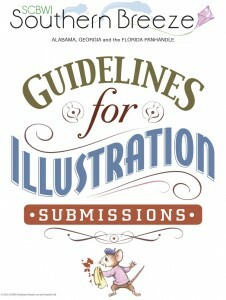 To download submission guidelines, click here: 2014 Illustration Guidelines. Articles about illustration are needed as well. If you have questions, please contact Art Director Prescott Hill. SBN appreciates One-Time-Rights for articles and illustrations we publish. After we have accepted / published the work you've submitted, you may pursue other avenues for publishing the article or art. It is against SCBWI policy to review ANY children's books in regional newsletters. Acceptable reviews include How-to books on writing and illustrating, and books of essays about children's literature.